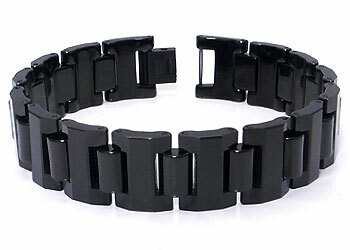 A TitaniumKay.com exclusive was the use of the color black in tungsten jewelry such as mens link bracelets. For sale is one such piece, the black tungsten carbide 16mm men's link bracelet. Made of black tungsten carbide with the links having both a high polish and matte finish. The men's bracelet is 16 millimeters wide and available in a wide range of size options, depending on inventory levels of current on hand stock. There is nothing like a wide piece of jewelry whether it's a ring, wedding band, or bracelet. Our black tungsten carbide 16mm men's link bracelet looks great whether worn for work or play it makes the perfect accessory. While many men would worry about wearing such a bracelet when made from the traditional precious metals such as silver or gold, with tungsten carbide there is no need to worry about the bracelet kinking, crimping, or even breaking. We are so sure of the strength of our jewelry it all comes with a 100% lifetime warranty. It is a brilliant bracelet. It is nice and heavy, which I hoped it would be, and goes well with my other silver bracelets. I bought this bracelet for my Husband for our anniversary and he loves it. It's a little big,but all it needs is a link taken out. I would recommend this site to anyone looking to buy some good Jewerly. An unusual & specific piece in color & form. Its shiny, rich, black texture commands attention. Had to buy a watch to match it but it was worth it. I'm very happy! I am very satisfied: the bracelet is superb, heavy, well designed and very attractive. Great service! We just love the bracelet. However, I ordered the wrong size and need a couple links taken out. Can any jeweler do that. So glad to find your web site.